Most folks can’t get by without that cup of morning joe. But when you’re done brewing, don’t toss those used coffee grounds — they can be as useful as the brew itself. Some cities and municipalities have green recycling programs that will accept coffee grounds; a few companies are even recycling coffee grounds to use for fuel. But even if you lack access to these utopic programs, there are many ways to reuse coffee around your home. Plants love coffee as much as you do. Used coffee grounds can be used as a productive fertilizer because it adds nitrogen, potassium, and a dash of magnesium to the soil. 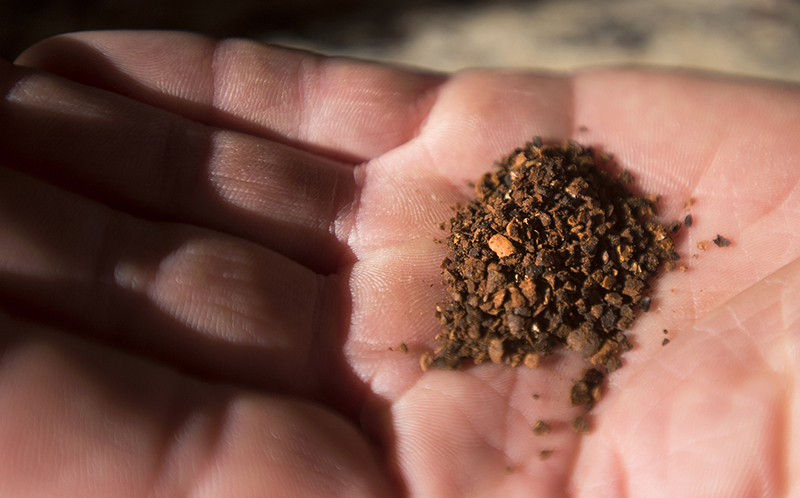 The consistency of coffee grounds is also handy for soil health. “When you put coffee in your percolator it’s very light. At the end, it’s very heavy and it retains water,” says says Brad Walker, founder of ReGround Organics in Ontario, Canada. “If you take that principle around your house, basically what you can do is mix it with your soil and help it retain water.” The aeration attracts worms and keeps the soil from getting hard like clay. Coffee grounds are especially good for flowers like azaleas, hydrangeas, rhododendrons, camellias, and roses that thrive in acidic soil. Mix grounds with dead grass clippings, brown leaves, or dry straw to neutralize it and prevent the waterlogged grounds from developing fungus or mold. Keep in mind that coffee grounds alone will not have essential nutrients for your plants like phosphorus and calcium. Walker recommends a ratio of 1 parts coffee ground to 6 parts soil to ensure the proper balance of nutrients. If you are not ready to use your coffee grounds in your garden right away, throw it in your compost heap as nitrogen-rich “green” matter. Mushrooms also thrive in coffee grounds because they require a substrate to grow. Moist coffee grounds are packed with nutrients that mushrooms require to grow, and the grounds have also been sterilized during brewing which provides a clean slate for mushrooms. Try adding coffee grounds over a mushroom spore and sawdust mixture to a container with air holes. Lightly spray the grounds daily to keep moist until the mushrooms appear; when the caps turn upwards, you can harvest them. Coffee grounds are also a useful repellent for pests like ants, snails, and slugs. Certain compounds in coffee like caffeine and diterpenes are toxic to insects. They also effectively deter mosquitoes, fruit flies, and beetles. Mix coffee grounds with a dried orange peel or rosemary oil to keep small mammals and curious cats away from plants as well. Like baking soda, used coffee grounds will absorb odor because it contains nitrogen. Dry the grounds on a cookie sheet in the oven. Fill old socks or pantyhose with the cool dried coffee grounds and tie them off to make portable air fresheners for your refrigerator, shoes, gym bag, or anywhere else that needs deodorizing. You can also freeze coffee grounds and run them through the garbage disposal in your kitchen sink to freshen up the smell. Like eggshells, coffee grounds are a natural abrasive. Sprinkle coffee grounds on a cleaning cloth to scrub stuck-on food from counters, dishes, or pots and pans. Coffee grounds can help clean out the fireplace. Scatter old grounds over the ashes to weigh them down and prevent them from forming plumes. You can minimize the appearance of scratches on furniture using a thick paste of coffee grounds and water. Apply the mixture to the scratch with a cotton swab and allow to sit for 5 to 10 minutes before wiping it off with a cotton rag. Coffee grounds can also be used to tenderize meat, and adding coffee grounds to your favorite dry rub recipe to give it a dark, crispy crust. Another handy kitchen tip: rub your hands with coffee grounds to remove the smell of garlic or onions after mincing and dicing. The versatility of coffee grounds brings a whole new dimension to having a productive morning. After you enjoy your morning caffeine boost, store your coffee grounds in an airtight container in the refrigerator (room temperature will make them moldy) until you are ready to utilize them for any of these many thrifty uses.